Though many people enjoy cycling as a hobby or as a way to get around, it does have disadvantages, which may be influenced on the safety of your area or your physical state while riding, for example. Thus, this form of transportation may not be suitable for every person for several reasons. While some areas have wide shoulders and bike lanes, drivers frequently disregard bicyclists and are at fault for causing cyclist injuries and even deaths. With only clothing and a helmet for protection, bike riders have a significant safety disadvantage in case of an accident. Many of the bicycle crashes caused by motorists go unreported, so it's almost impossible to determine the exact number of cyclist injuries per year. The dangers of sharing a road with cars has made some cyclists decide that the risk of biking is too high and they instead turn to driving cars or other forms or transportation. Riding a bicycle is not recommended in icy, snowy or rainy weather. Also, cyclists may be uncomfortable when the wind is high or there are high temperatures. In areas that have adverse weather conditions frequently, bicycling is not an option as a reliable form of transportation. In order to be safe, cyclists have to check weather conditions before setting out in order to ensure they will be able to get where they need to go safely. Biking is a fairly expensive hobby. Forbes estimates that buying a fairly good used bike could cost about $150 to 200, although a new one is substantially more expensive. The equipment needed for the bike, including a helmet, gloves, lights and other related items, may cost approximately $300. Additional costs involve bike maintenance. While yearly bike-related costs should be less than car-related costs, infrequent cyclists in particular may find the cost of biking to be a financial burden nonetheless. Cyclists may experience traumatic and overuse injuries. While traumatic injuries can primarily be attributed to accidents, overuse injuries frequently occur in cyclists who ride regularly. Lower back pain is common in cyclists since they use their lower backs to control and power the bike. The stress added onto the back may produce chronic pain. 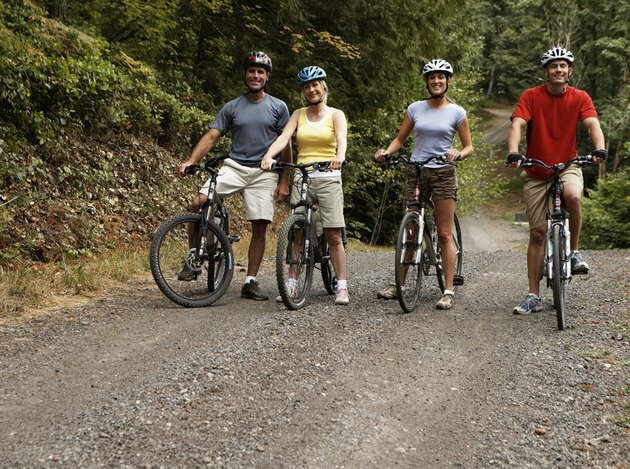 Bike riders may also suffer a variety of injuries to the tendons or muscles in the knee areas. In some of these cases, it may be necessary to see a doctor or physiotherapist.